Cuts heal. Bruises fade. Broken bones mend. The body’s ability to heal itself is truly amazing. But tooth enamel is different. When it’s gone, it’s gone. Though thin and partially translucent, tooth enamel is the hardest substance in the body and has the critical job of protecting teeth from constant use and the continual assault of chemicals in food and drink. Enamel also shields tooth nerves from hot and cold food and beverages. That’s why enamel loss often causes tooth sensitivity. The team at Mirelez Wellness Dental encourages our Clovis area patients to protect their tooth enamel for a lifetime of dental health. This may seem counterintuitive, but sometimes it is better NOT to brush immediately after eating. Specifically, after eating acidic items. 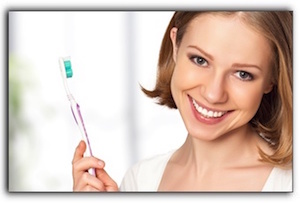 The acid weakens the enamel which can be further weakened by brushing. Waiting 60 minutes will allow the acid to dilute. Rinsing immediately after eating acidic foods is useful, however, because it washes away some food particles and speeds up the dilution of the acid. Some Fresno dental patients don’t realize that dry mouth can cause or exacerbate enamel erosion. The calcium and phosphate in saliva protects your enamel. When there is little saliva, the enamel is left unprotected. Chewing stimulates saliva production but constant snacking is not the answer for dry mouth. Chewing sugar-free gum and sipping water frequently can stimulate saliva production between meals without increasing the risk of decay or upping your calorie intake. Not surprisingly, tooth grinding wears enamel away. If you are one of the many Fresno residents who grinds their teeth at night, it’s vital to get a mouthguard ASAP. People who grind their teeth are at a high risk for enamel erosion and the decay that can follow. Athletes should also protect their teeth on the playing field with a mouthguard. For more details, talk to Dentist Art Mirelez at Mirelez Wellness Dental about custom mouthguards. If you sip soda, tea, or coffee all day, we suggest you switch to water to halt any enamel erosion that has already occurred. It may be a hard change to make – but if you are successful – your teeth will thank you for it. Using teeth as tools can harm enamel, as well. Take a moment to fetch scissors before tearing open a package or ripping duct tape with your teeth. Do you really want to take a chance on chipping a tooth just to open a package of lunchmeat? Chewing ice and hard candy can also damage enamel. If you simply must have sugar, soft candy is best as long as it is not left to sit on teeth for long period of time. If your molars are packed with gummy candy all day, you will develop cavities which erodes enamel just as effectively as chipping it with hard candy. Many of the old-school hard candies we enjoyed as kids now come in soft versions. Enjoy them sparingly because constant sugar is bad for teeth. Period. If you have already experienced enamel erosion or other dental problems, Dentist Art Mirelez can help you protect what is left. To schedule an exam, contact Mirelez Wellness Dental in Fresno at 559-435-3113!